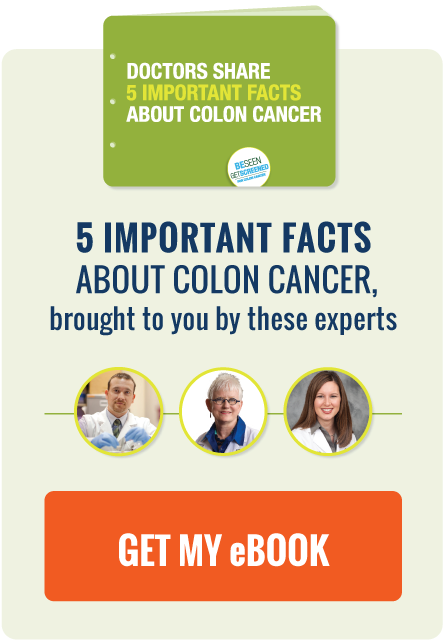 Be Seen, Get Screened's Physician Spotlight Q&A series highlights the work of health care professionals on the front line in the fight against colon cancer. In our latest Q&A, we talked to Dr. Kelly Finan, a colorectal surgeon at Mary Bird Perkins – Our Lady of the Lake Cancer Center. Be Seen, Get Screened: Can you tell us a little bit about your professional background with colon cancer and colon cancer screening? Dr. Finan: I am a colorectal surgeon and treat a number of patients with colorectal cancer, so it's a cause near and dear to my heart. Colorectal cancer remains the second leading overall cause of cancer related deaths in the United States, but it is one of the more preventable cancers. In the average person, colon cancer develops from a precancerous polyp. It usually takes 5-10 years for cancer to result. By screening with colonoscopy we can identify polyps and remove them, helping to prevent the formation of colon cancer. BSGS: As a colon rectal surgeon, what are some common objections to colorectal cancer screening you hear from patients? Dr. Finan: Patients frequently delay screening due to fear of the bowel preparation necessary to thoroughly clean the colon or pain from the procedure. The bowel preparation has become easier; most physicians now use a low volume, split dose bowel prep. As a result, you can eat a light breakfast the day before the procedure and then drink liquids the remainder of the day. You then drink one small glass of the bowel prep that evening and a second the next morning before the procedure. As for the colonoscopy, it is not a painful endeavor. You will get an IV in your arm and receive medications to safely sedate you so you are unaware of the procedure. Most patients wake up surprised it is all over. Dr. Finan: Screening has been proven to decrease the rates of colon cancer. The benefit of screening is that the signs and symptoms of colorectal cancer can be very vague: abdominal pain, change in bowel function or caliber of the stool, blood in the stool, or unexplained weight loss. These are often symptoms that are slow in onset and easily ignored or attributed to other medical conditions. Often, early colon cancers have no symptom to trigger the patient to get a colonoscopy. If a colon cancer is diagnosed on a colonoscopy, we hope to catch the disease early when it is surgically curable. We first look at the depth of invasion in the colon wall. Most tumors that are confined to this area can be successfully treated with surgery alone and require no further treatment. Tumors that have spread to lymph nodes or other organs often require chemotherapy and sometimes radiation. The earlier the stage of the cancer, the better the long-term outcome for the patient. BSGS: Besides screening, what do you recommend to patients to improve colorectal health? Dr. Finan: The best thing you can do is live a healthy lifestyle! Consume a diet high in fruits and vegetables, milk, calcium and folate. Exercise regularly and maintain a healthy weight. Limit red and processed meats, saturated fats and alcohol consumption. BSGS: How did you get involved with Get Your Rear in Gear? Dr. Finan: I noted that we didn’t have any kind of large scale community awareness program in Baton Rouge dedicated to colorectal cancer awareness. I had previously participated in a Get Your Rear in Gear 5K race sponsored by the Colon Cancer Coalition in another state and thought it would be a great event to bring to our community. Through this race we are able to educate the community about colorectal cancer, honor our colorectal cancer survivors and remember those we have lost to this disease. Seventy-five percent of the funds we raise through the race stay local to help with community education and advocacy as well as support colorectal cancer patients. This year’s event is set for April 18 at Pennington Biomedical Research Center in Baton Rouge. BSGS: How big of a difference do awareness events like Get Your Rear in Gear make when it comes to improving patient awareness and compliance with colon cancer screening? Dr. Finan: I think they make a big difference. The more we talk about colon cancer, the more people understand the disease, how to prevent it, when to get screened, and how to treat it. By breaking down these barriers, I hope we continue to lower the colorectal cancer rates in our community. Since Get Your Rear in Gear was created, I have had a number of people tell me the information they received at the race, or from information funded by the race, encouraged them to get screened; so I know we are making a difference. BSGS: What other types of events do you and other physicians at Mary Bird Perkins – Our Lady of the Lake Cancer Center do to increase colon cancer awareness in the community you serve? Dr. Finan: Ongoing cancer screening programs are offered throughout the community on a regular basis. Our Colorectal Cancer Multidisciplinary Care Team, with which I am involved, is always working to raise awareness of colorectal cancer while striving to provide the best care possible to those with the disease. BSGS: Is there anything else you’d like to share with Be Seen, Get Screened? Dr. Finan: Don’t put off screening! It may save your life! If you have a colonoscopy and it’s normal, you don’t need another one for an entire decade! If you have a benign polyp, it can be removed, PREVENTING you from developing cancer. There are few other screening tests that are also preventative.